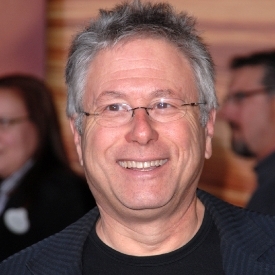 Alan Menken was born in New York City in 1949. He attended New York University’s College of Arts and Sciences, where he graduated with a degree in musicology. After graduating, Menken tested out his composition skills with a rock-ballet, Children of the World, for The Downtown Ballet Company. Although not a success, Menken’s breakthrough came with the huge hit, Little Shop of Horrors (1982). It set the record for the highest grossing Off-Broadway show of all time and opened in Los Angeles and London, as well as embarking on several national tours. Little Shop was turned into a film musical in 1986. Menken first worked with Disney on the 1989 film, The Little Mermaid. He then went on to Beauty and the Beast (1991), Aladdin (1992), and Pocahontas (1995), with Menken walking away with two academy awards for each of the four films. He has continued to work with Disney on works such as The Hunchback of Notre Dame (1996), Enchanted (2007), and Tangled (2010) among others, as well as composing for Broadway shows. In 1994 Menken make his Broadway debut with a musical version of Beauty and the Beast. This was a huge success and ran for 13 years, before closing in 2007. As well as a stage adaptation of The Little Mermaid (which ran on Broadway from 2008-2009), Menken’s production of Sister Act first opened in London in 2009 before moving to Broadway in 2011. His new musical adaptation, Newsies (2012), earned Menken the Tony Award for Best Score. In 2012 he earned the achievement of having three Broadway musicals playing in the same season with Sister Act, Newsies, and Leap of Faith (2012), an adaptation of the Steve Martin film of the same name all running silmultaneously in the early months of the year. His Broadway adaptation of Aladdin (2014) was nominated for Best Original Score and just celebrated 4 years on Broadway in March of 2018, while an adaptation of A Bronx Tale (2016) also continues is run on Broadway as of this writing. In 2017, Menken wrote four new songs for the film adaptation of his own Broadway version of Beauty and the Beast starring Emma Watson, Dan Stevens, and Emma Thompson. In 2010, Menken received a star on the Hollywood Walk of Fame. Throughout his career so far, he has won eight Academy Awards, seven Golden Globes, eleven Grammy Awards, and one Tony Award and countless nominations.